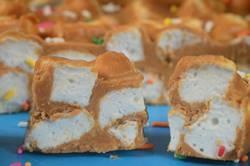 This used to be a children's treat, until it was made with homemade marshmallows. Then it turned into a gourmet confection. You only need four ingredients to make this delicious No Bake confection; homemade marshmallows, peanut butter, butterscotch chips, and butter. While you can use store bought miniature marshmallows in this recipe, I encourage you to make your own. Homemade marshmallows are just so good and they're fun to make. Every time I make homemade marshmallows, I am surprised that only a few ingredients are needed to make this candy. Just gelatin, water, sugar, corn syrup (or golden syrup or liquid glucose), and vanilla extract. Marshmallow making begins with unflavored gelatin as this is what gives the marshmallow its dense and spongy texture. In order for the gelatin to do its job properly, we need to first soften it in cold water. Then, while the gelatin is absorbing the water and becoming nice and spongy, we need to make a cooked sugar syrup. Once this is done the two mixtures (gelatin and sugar syrup) are combined and whipped until thick and fluffy. What is amazing is how this mixture starts out opaque in color, yet gradually transforms itself into this shiny and thick white fluff that looks like a meringue. Only, unlike a meringue, the marshmallow is very sticky and needs to sit at room temperature for at least eight hours or until it sets. Now, you won't need all of your homemade marshmallows to make these bars. So you could use the leftovers to make one of these delicious treats: Rocky Road, S'Mores, Rice Krispies Treats, Smore Granola Bars, Rocky Road Brownies, or Cherry Squares. Homemade Marshmallows: Lightly butter, or spray with a non stick vegetable spray, the bottom of a 13x9x2-inch (33x23x5-cm) baking pan. Line the bottom of the pan with parchment paper. Then sift about 1/4 cup (30 grams) of confectioners (powdered or icing) sugar onto the bottom of the pan (this will help release the set marshmallow from the paper). Next, place 1/2 cup (120 ml/grams) cold filtered water into the bowl of your electric stand mixer that is fitted with a whisk attachment (or with a hand mixer). Sprinkle the gelatin over the water and let stand until gelatin softens, about 10 minutes. Meanwhile, in a heavy two quart (2 liter) saucepan, place the sugar, corn syrup, salt, and remaining 1/2 cup (120 ml/grams) cold water. Stir over medium heat until sugar dissolves and the mixture comes to a boil. Cover the saucepan with a lid and let boil for about 1-2 minutes to allow any sugar crystals to dissolve from the sides of the saucepan. Remove the lid and attach a candy thermometer to the side of the pan. Increase heat to medium high and boil, without stirring, until the syrup reaches 240 degrees F (115 degrees C) (this will take about 10 minutes). Remove from heat. With the mixer running at low speed, slowly pour the hot syrup into the gelatin mixture in a thin stream down the side of the bowl. Gradually increase the speed to high and beat until the mixture has tripled in volume and is very thick and stiff, about 10 minutes (looks like thick marshmallow cream). Add the vanilla extract and beat to combine. Scrape the marshmallow mixture into the prepared pan and spread with a damp offset spatula or rubber spatula. The mixture is very sticky so just smooth it out as best as you can. Dust the top of the marshmallow with another 1/4 cup (30 grams) of confectioners sugar and let stand, uncovered, at room temperature until set, about 8 hours. Remove the marshmallow from the pan by first running a small sharp knife around the edge of the marshmallow to loosen it from the pan. Invert the pan onto a large cutting board that has been dusted with confectioners sugar. Peel off the parchment paper (the marshmallow will be sticky) and dust the top of the marshmallow with confectioners sugar. Cut the marshmallow into small bite-sized cubes using clean kitchen scissors, a pizza roller, or a sharp knife. Dip the cut sides of the marshmallows in additional confectioners sugar. Shake off excess sugar. You will need 6 cups (450 grams) of miniature marshmallows. The marshmallows can be stored in an airtight container, at room temperature, for up to two weeks. Peanut Butter Marshmallow Bars: Line the bottom and sides of a 9 inch (23 cm) square baking pan with parchment paper or wax paper. Place the 6 cups (450 grams) miniature homemade marshmallows in a large bowl. In a stainless steel bowl, placed over a saucepan of simmering water, melt the butter, peanut butter, and butterscotch chips until smooth. Remove from heat and let cool until tepid. Then pour over the marshmallows and gently fold, using a spatula or large spoon, until all the marshmallows are coated with the peanut butter mixture. Pour into the prepared pan and smooth the top. Can decorate the top with candy sprinkles. Place in the refrigerator until firm (about one hour). Remove the bars from the pan using the parchment paper. Use a large knife to cut into bars. The Peanut Butter Bars can be covered and stored in the refrigerator for about two weeks or they can be frozen for two months. Makes about 27 - 1 x 3 inch (2.5 x 7.5 cm) Bars.